Come & experience our beautiful beach frontage, 1500 ft! We have clean, air conditioned bathhouses & a complete convenience store. Close to Daytona & St Augustine. Pets & clubs welcome, all sites 30/50. Awesome If you like the ocean and the ruggedness that it provides this is an awesome place to stay. Wonderful beach friendly people will definitely return. Great Park! our first trip here. My wife & I stay for 5 days & Nights the week after labor day weekend. The Park's ocean side lots were only half full that week as we had hoped (one reason why we picked that week) Check-in was easy, we had made our reservation about 2 weeks in advance. The staff was very accommodating even giving us an list of lots available, if for any reason, we decided we did not like the location of the lot we had reserved. Parking my 5th wheel was easy, plenty of room. The store was great having almost anything you need, and open till 9 p.m. 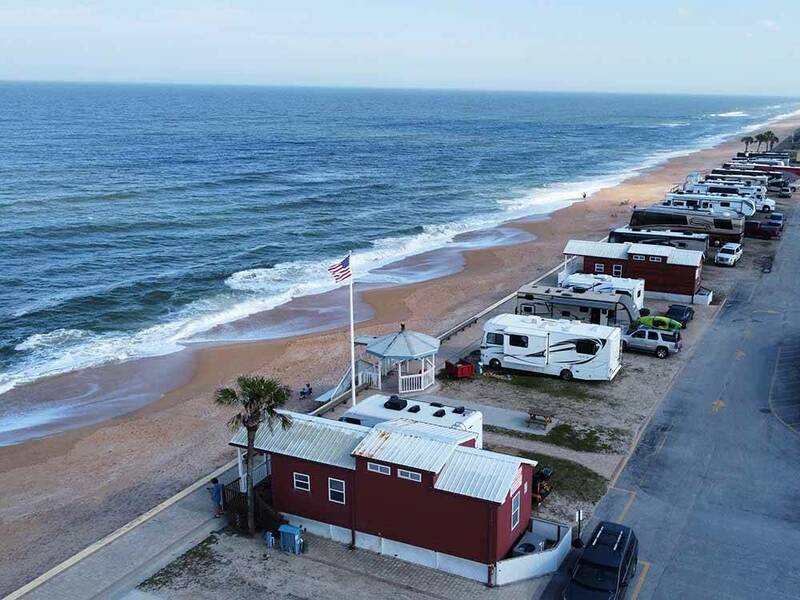 The park & restrooms/showers were very clean, and an easy walk to the beach (practically had the beach to ourselves) We had an ocean view lot with A1A traffic going by, but we didn't even notice it because the sounds of the ocean waves pounding the shore & the breeze was plenty awesome which is why you RV on the beach, right? All the other RV'ers we met in the park were very nice people. Plenty of very good local restaurants in nearby Flagler Beach, Palm Coast. We spent one day in St.Augustine, touring the old city and attractions, easy drive from the park. My only negative was that it was so breezy during our stay we could not keep our awning open very much, but the weather is not the park's fault, is it? Definitely recommend this park! It will now be our go-to beach trip for a week every year now. 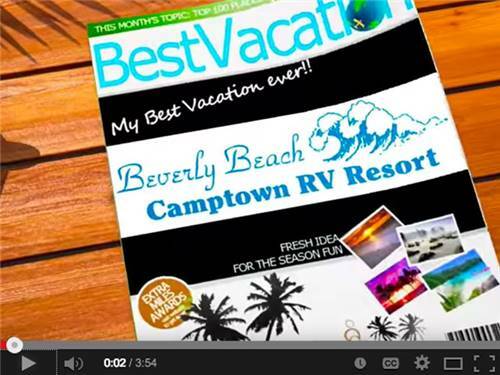 We stayed at Camptown for 2 nights and enjoyed our stay. They are still trying to recovery from Hurricane Matthew, so the office is in one of the cabins. The store has downsized due to construction efforts, but is still open. They are a little pricy, but you are a few steps right from the Beach!!! Bathrooms are clean, but not new. Everyone is extremely friendly and great to talk with. Short drive to many area attractions, restaurants and stores. This is a nice facility but the price is really, really high. They change them at the last minute. We made reservations, were given one price, and at check in were told it had gone up. We went on to stay at another park. It was over $120 dollars a night. I can get a local hotel for less. Pricey but worth it! Right on the beach! Clean, quiet & safe! Hot summer day next to the beach! The park is easy access in and out... You are literally steps to the beach... Important info: Bugs are Minimal! (Ocean breeze controls them)...There is an Ocean Breeze (so plan for wind, especially later day... Sturdy your AWNING!! !Trust it! ...There is little shade, so expect FL sunshine (and heat). D) You call pull forward on Oceanfront row (Great view)...Oceanfront is expensive... It is also the ONLY row with NO DISCOUNT offered. Oceanview is next to it and 10% discount... The store is comparable priced... The electric is 50A, but they offer a 30A adaptor...... Fun in the Sun! We first stayed at Camptown in the summer of 2014. We were not sure we would like the park, and it was a little pricy. They told us the price had gone up due to recent upgrades. We booked for a month, in July. We loved it. Our site was perfect and everything was great. The staff was friendly and very helpful. We liked it so much we immediately booked for another month at the same time for 2015. Prior to our arrival the following July in 2015 we contacted Camptown to make sure all was well, We then headed south for the five hundred mile trip. When we arrived we were told the price had gone up an additional $500.00. We were stunned. We had driven all this way and were told the price was much more. What else could we do on short notice, so we stayed and paid the new rate. Again, everything was great including the staff and our site. When we checked out we were told that due to new policy changes, we could no longer stay in their premium site unless we paid the full daily rate with no discount for a monthly stay. However, we were advised that we could stay in a standard site and receive the discounted monthly rate. We were also told we could no longer book a year in advance, however we could fill out a form and be put on a list. We would be notified six months prior to our reservation of the 2016 rate and if our site was available. We asked at that time if anyone else had requested the site we wanted and were told no. Well, six months prior to our reservation past and we heard nothing. Four months prior to our reservation, still no word. I called Camptown, I was told that the site we requested was booked but they had additional premium sites available for a higher rate, due to "upgrades in the park". Our requested site was given to someone else over us and we would be forced to pay a higher rate, which we could not afford. Not a way to treat someone who had already stayed at the campground twice for a month at a time. If you do stay at Camptown, you will enjoy your stay, however, beware and get any pricing quotes in writing. It appears the owner is more concerned with his "bottom line" than he is with customer service. A little pricey but an awesome place if you want to stay on the beach. This is a beautiful beach, not crowded at all and unlike most beaches, you can have a campfire and dogs are allowed. Facilities are not new but are very clean, staff was very nice and the store is well stocked. We will go back every chance we get!